This week Awesome Stories brings you the benefits of aging, wildlife crossings, book carving, hempcrete and 100 Thank Yous. This is maybe the most inspiring story I’ve seen in the last year. 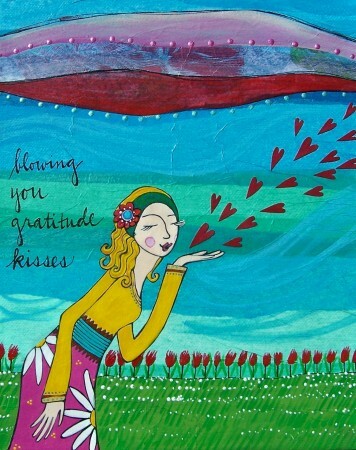 Lori Portka created a beautiful and unique way to express more gratitude in her life called A 100 Thank Yous. First she created a list of 100 people to whom she wanted to say ‘thank you’. Then she created a personalized painting for each person, along with a great story too! Finally, she held an exhibition to share the art and gratitude in person. Watch the video to hear her inspiring story! Washington State has started construction on an extensive system of bridges, overpasses and underpasses to allow wildlife to safely cross I-90 in the Cascade mountains. This is a huge step in allowing wildlife safe movement across their natural territory in the Northwest. This project complements the world’s most extensive network of wildlife crossings on the Trans-Canada Highway in Banff National Park. Additionally, some areas in Europe have some wildlife crossings. Awesome progress. This article offers some fun insights and benefits to aging. The author has clearly made peace with death and aging. Suzanne Levine talks about death being a constant companion that stirs her to live with urgency. At the same time, she has lost any need to please others and gained a greater sense of peace, confidence and gratitude in her life. She follows her passions, does only one task at a time and frequently makes spontaneous choices. More importantly, she knows what is important like her friends and makes choices accordingly. Viva la aging! 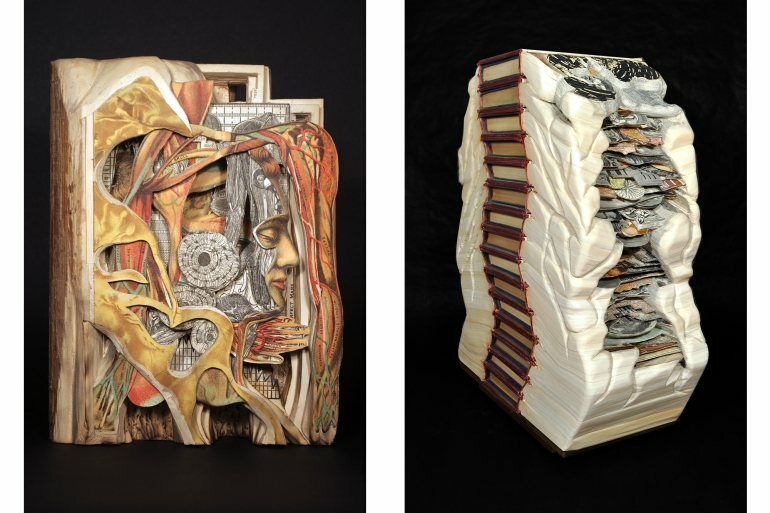 Brian Dettmer creates art from old books and reference materials. He seals them with varnish, then starts carving away at the pages with an Exacto knife. He adds no color or text, in what he calls “a subtractive sculptural process.” The results are amazing sculptures that explore how we interact with information in a whole new way. I find them visually stunning and would love to see them close up. Left: “Absolute Authority” courtesy of the artist and Wexler Gallery. Right: “Totem” courtesy of the artist and MiTO Gallery. I’ve written before about hemp and hempcrete. Hemp, an amazing plant, is being reintroduced for its numerous benefits and uses. Plus, it reaches maturity in only 14 weeks! In terms of buildings, hempcrete could revolutionize construction. It is stronger, lightweight, breathable, long lasting and carbon neutral to use! Hempcrete can moderate moisture over time without harm to the material or home. And over time, hempcrete gets stronger as it hardens and pulls CO2 from the atmosphere! Happy Independence Day! May you know true freedom that comes from within. Great stories here ~ the benefits of aging was beautiful, and every day is worth enjoying and living (not an easy concept to understand in our everyday life). And like you I was also very much taken by A Hundred Thank-yous ~ stacks of love there indeed. Enjoy your weekend Brad. Thanks Randall. I’m learning to embrace my aging, yet still enjoying and stretching. And no matter what, to keep opening to more love. I appreciate your reflections. Thanks Shauna! Oh how I love reading your heart-warming comments. 🙂 I suspect you already are like Lori with your passionate encouragement. You could send people notes of encouragement. I know people would love them. And maybe you could combine them with Mark’s photos for photo notecards? Thank you for sharing these, hope your week is off to a good start! I have my own theory on this..